Teresa or TT for short, created her own niche/ brand by combining 2 words Journey and Journalist to make “Journeyist.” She dubs herself the #Joyful Journeyist because she believes “Life is a Journey, FULL OF JOY, and meant to be shared.” On her website: Joyfuljourneyist.com, she shares her life adventures as you see the world through her eyes. Do you work from home or in an office? I work from home, (which is all over the World). My home base is a home in Texas but to me: “Home Sweet Home” is really WORLD SWEET WORLD! Do you work alone? Work with a partner or team? Alone. My silent partner is my Boss, Jesus! He is in charge of my day and has final say so on my products. What are your most productive work hours? Between 11 pm and 4 am is usually when I get my best writing done. I worked overnight shift as a Medic in the military for many years. My brain and body just continue to be on night shift. The daylight hours are reserved for actual streetwalking. What is the biggest/best investment you’ve made towards your brand/blog? Purchasing the trademark for my name/brand that I created: #Joyful Journeyist. I knew it was going to eventually bring income to me and my family and I wanted to make sure I retained all rights to it. What book are you currently reading? What is it about? “Your Life Calling” by Jane Pauley. Its about redefining retirement and “Reimagining the Rest of Your Life”. I am already living this book and am thankful she already wrote it for me! One less book I have to write in the future. What is your dream job? Are you doing it right now? I AM! Living a life full of JOY, travel, and sharing my love and passion with the world. Inspiring women and giving them the confidence to travel independently and shedding the norms that society and media have placed on them. Diversity is Beauty and we should ALL embrace what makes us different (our outside appearance, culture, upbringing) while celebrating the things that make us the same (our hearts and our desire to just fit in and be loved). Changing media by liposuctioning the CRAP out of it, redefining what “WE” want as a society and changing the view of the Golden Years are probably my top 3 missions as I find and live my purpose on a daily basis. 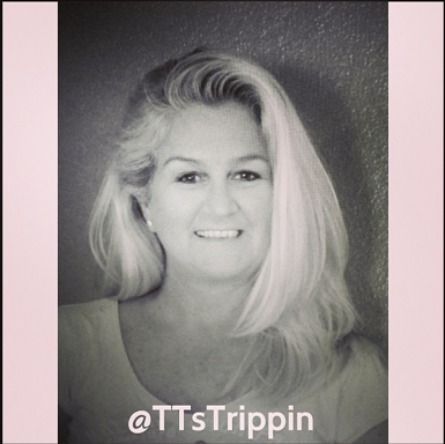 Connect with Teresa on Twitter at @TTsTrippin and see her beautifully curated images on Instagram. This article is perfect. I love TT and her travels full of imagination, excitment and adventure. She is always upbeat and happy and finds the coolest places to go. TT also has a huge loving heart and that shows in her writing. Plus she is gorgeous! I’ve been lucky enough to have her as my personal travel guide on vacation trips….that’s a real inspirational adventure. Keep those fingers writing girl. Great Job. you really ARE gorgeous Teresa! Kudos on all of your success.